I confess, I am not a fan of longganisa. There’s something about the texture that I’m not too pleased with. But crumble, refry and work it into rice, and you’ll have me rushing to the table. Yes folks. I don’t like longganisa but I love longganisa fried rice. It sounds silly, doesn’t it? I guess it really just means that hunger (and not being offered anything to eat other than what you don’t like) pushes one to be creative. You can use any native longganisa that you have on hand. Leftovers are preferable because you’ll be working with pre-cooked longganisa. The longganisa I used for the above photo is from Tuguegarao. It’s a very garlicky variety that has annato, so its red-colored oil gave my rice a lovely orange hue. And you can also substitute the veggies I used. Sometimes, I like throwing in finely minced carrots. Or frozen mixed carrots, peas and corn. But given the choice, peas and green onions are what I like using best. You can also skip the kesong puti. We had some on hand when I was cooking, so I thought I’d try it. A good choice, apparently, because it was wonderful. But don’t let its absence stop you from cooking. It’s good enough even without. It’s really a use what you have dish. Skin then crumble the longganisa. Toast over low heat. Some longganisas are oily and will render their own fat. This is ideal. If it doesn’t, you can add a bit more oil to help in the process. Once done to your desire (crisp in my version), fish your longganisa bits from the oil. Leave about 2-3 Tbsps of rendered oil in your pan. Saute garlic until it darkens a bit but isn’t brown yet. I usually wait until that part where it’ll turn crisp in a few seconds. Dump your rice in. Saute until adequately oiled. Add your peas and green onions. 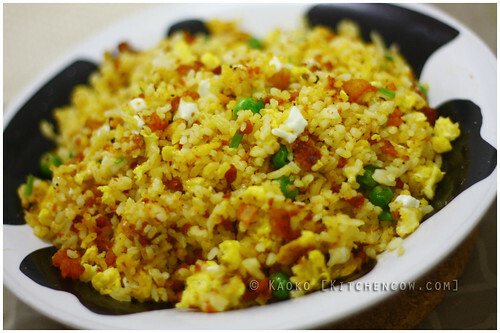 When rice is thoroughly heated, make a well in the center, then dump the egg in. Allow it to set. When it’s halfway cooked, use your spatula to scramble the eggs, creating small lumps. After it’s fully set but not dry, work the cooked egg bits into your rice. Turn off the heat, then finish with your kesong puti chunks.